Looking for a way to amp up the flavor of your favorite vegetables? 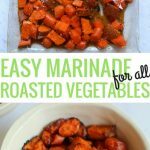 This easy vegetable marinade works with almost any vegetable and makes the perfect healthy dinnertime side dish for a busy weeknight meal. When I first began cooking for myself after college (you know, aside from microwaving Lean Pockets and quesadillas every night) I subscribed to a couple of food magazines, browsed around the internet for recipes began experimenting in the kitchen quite a bit. I found a love for creating delicious and healthy meals but when I began really cooking for the first time, I was incredibly intimidated! I’m pretty sure I had never even roasted a vegetable until after college (seriously!) and since I didn’t think I liked most vegetables, it took me a while until I began picking out new vegetables like rutabaga and okra to try at the grocery store. 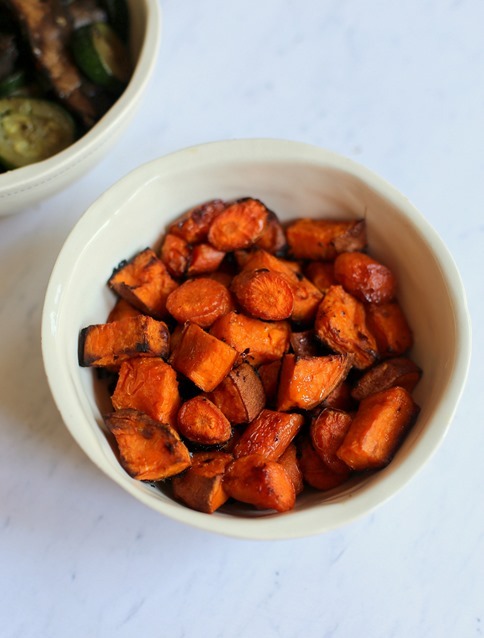 I quickly realized that the preparation method makes a world of difference for many vegetables out there and, for the most part, I generally like vegetables a lot more when they’re roasted. Over the years, I’ve found tons of different ways to prepare vegetables to make them taste delicious but a vibrant and flavorful batch of roasted vegetables cannot be beat. The recipe I’m sharing with you guys today is for a vegetable marinade I’ve been using for a while now that seems to work with almost any vegetable out there! I’ve used it on everything from Brussels sprouts and carrots to zucchini and green beans and absolutely love it. Of course the cooking time for the veggies will vary but the marinade stays the same across the board. After you make this marinade once, you’ll quickly realize it’s such an easy one to eyeball and there’s plenty of room for error so measuring everything out won’t be a necessity after you’ve made it a time or two. Easy is the name of the game around here! Fill a gallon-size freezer bag about halfway full with vegetables of your choosing. Add remaining ingredients to the bag and toss to coat the vegetables in the marinade. Place the sealed bag into the refrigerator and space out the vegetables so they lay flat and soak in the marinade. Allow to marinate for 2-4 hours. Remove the vegetables from the marinade and spread vegetables out on a baking sheet sprayed with cooking spray. Season with additional salt and pepper. Roast vegetables at 425 degrees until they reach your desired level of doneness. The roasting time for your vegetables will vary depending on what vegetable (or combination of vegetables) you choose. Check your veggies and toss every 10-15 minutes. Please see recipe notes below for guidance! As you decide what vegetables you want to pair together, I recommend pairing similar vegetables together (such as broccoli and cauliflower or carrots and sweet potatoes) to keep roasting times easy and consistent, as some vegetables will be done much faster than others. I typically roast my vegetables at 425 degrees and find that thin/soft vegetables like green beans, asparagus and zucchini are done the fastest (often within 15 minutes) while potatoes, carrots and butternut squash can take 25-45 minutes, depending on how small or large you slice them. 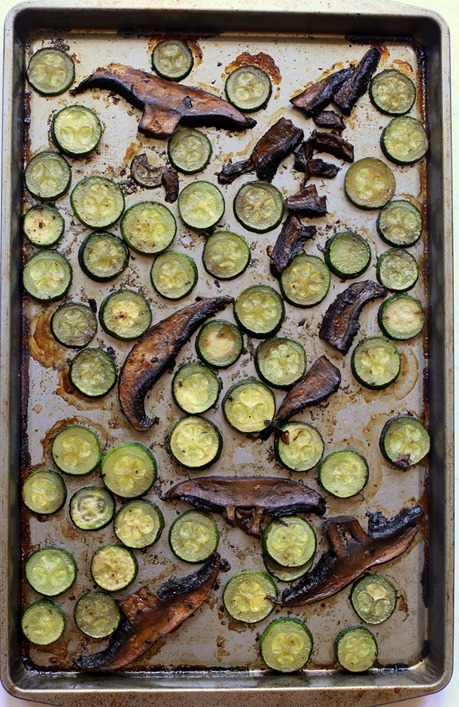 For the zucchini and portabella mushrooms seen in this post, I roasted the vegetables at 425 degrees for 15 minutes. I roasted the carrots and sweet potatoes at 425 degrees for 35 minutes. 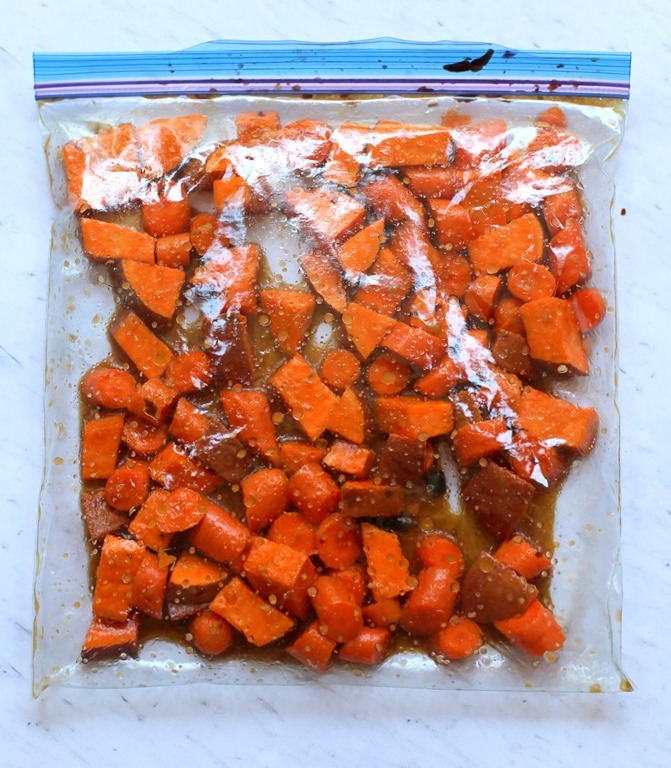 When you initially make this marinade, you may not think that there is enough liquid in the bag but once you toss the veggies and lay them out flat to marinate in the fridge, you’ll see the marinade goes a lot further than you might think! The marinade also works well on chicken, pork and steak. I’ve been trying to incorporate ginger more and more into our diets since it’s so good for settling stomachs! I’ve never though to add it to roasted veggies, yum! Ginger is my fav!! So good! Mmm the flavors in this marinade are some of my favorites, but I’ve never thought to do something like this with roasted vegetables. I’m definitely making this next week, thanks!! Such a great idea to marinade vegetable. I usually have no problem eating veggies just with olive oil and sea salt. But when I’m cooking for others I know they usually want more flavor. 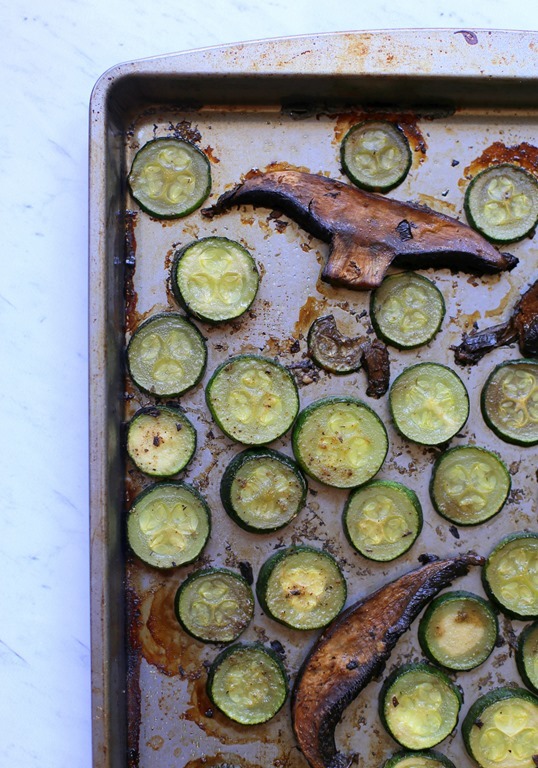 100% agree that roasting veggies is a game changer. I usually keep it simple with olive oil, salt and pepper…but this seems really easy, too, so I will be changing it up! Yes! Roasted veggies all the way! This combo sounds great! What’s your go-to veggies? I feel like mine are peppers, mushrooms, and onions! Lately I’ve been all about Brussels sprouts! We are all about roasted veggies here! I have never thought about using coconut aminos or ginger on my veggies! Can’t wait to try that out! This is a great, different veggie marinade – thanks! I usually just use olive oil, a ton of garlic, salt and pepper, and a bunch of random spices, but I’m always looking for ways to mix it up. I recently tried coconut aminos for the first time the other day and was pleasantly surprised at how much I loved the flavor. I completely agree, roaster (or broiled) vegetables taste so much better than anything else! I normally just do olive oil, salt, and pepper, but I like this marinade idea a lot. Thanks for sharing! Yum!! I’ve never roasted veggies before but after reading this post I think I will! Trying this next week after my grocery haul!!! This sounds great! We love creating different sauces/marinades for veggies. As a plant-based eater, it has helped me get more creative in the kitchen to find ways to make veggies taste so mouth-watering good, no one can resist! haha. I will definitely be trying this one! I’ve never tried ginger on veggies before. Will have to try this! Yum! This sounds so good, I can’t wait to give it a try! Hi Julie! I can totally relate to your story! As in — I didn’t roast a vegetable until WAY after college. In fact, in college and after, I always tried steaming them, and NEVER enjoyed them. Roasting is by FAR my favorite way to eat veggies. I usually use a mixture of coconut oil, turmeric and sea salt — but I love you addition of coconut aminos. I need to try that!! Turmeric is a great idea! I love these flavors together, I will have to give it a try. Maybe with some crushed red pepper for a little kick. I am sure it taste much better with fresh garlic but to be honest…garlic is not my favorite to mince. On weeknights when things are crazy I like to use garlic paste. I am SOOO excited for this, since incorporating everything other than plain vegetables cooked in traditional ways seems to be so hard to do for me. I’ve been trying to get ’em into my life in every way possible, and I’m so happy to have this marinade to try! Can’t wait! Thanks for another great recipe. Adding it to my roster! I typically don’t go the Asian route when cooking vegetables so I’d love to mix it up and try this! I tried this on a mix of squash, mushrooms, and peppers. It is awesome. I have been using the vegetables in the morning and making scrambled eggs to eat with them. Delicious! This is definitely going to become a staple marinade for us! Roasted veggies are some of my favorites, I never thought of doing mushrooms though, I will have to try it next time. They are great to eat by themselves or as a side dish. What do you usually pair them with?